Bobby Riggs and Jack Kramer: from opponents to business partners. By the middle of 1949, Bobby Riggs was burned out. Having been beaten by Kramer an embarrassing number of times at the end of the 1948 North American Tour, Riggs had pulled himself together enough to win the U.S. Professional Championships at Forest Hills against Don Budge. But his best playing days were over, and his fans were losing interest. 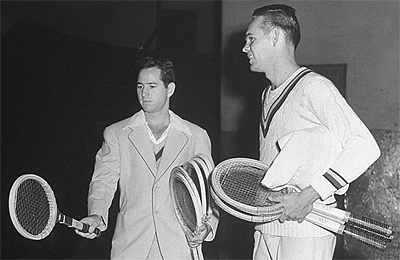 Jack Kramer's star was in the ascendancy, and the tour had only served to enhance the younger man's image, while Riggs admitted that he was depressed and exhausted. So Bobby Riggs, never one to flinch before a big gamble, retired his tennis racket at the age of thirty-one. But he wasn't finished with tennis by any means. With Jack Harris out of the picture, he saw a chance to stay in the game as a promoter.